A couple of weeks ago, I picked up a hand-cranked ice shaver (affiliate link) on clearance at Target. Snoballs (aka snow cones) were a prominent part of my Louisiana childhood. My mom thought they were ridiculously expensive for sugar syrup and ice so I never ate very many (mom’s right). I didn’t want to deprive my kids from the melt in your mouth experience of snoballs, but I wanted to make a slightly healthier version. 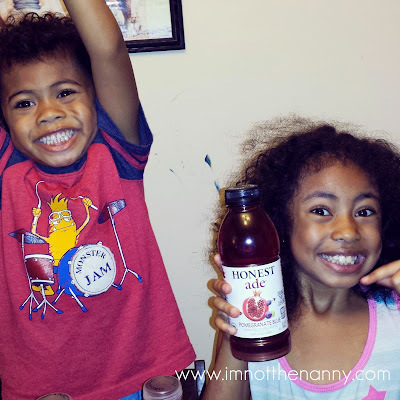 I’ve been a quiet fan of Honest Tea for a while and was excited to chat with them at BlogHer. Fate ended up sitting me in the same row as Jordan, one of the Honest Tea guys, on our flight back to DC. (Honest Tea is based in Bethesda, MD.) Turns out Jordan is a foodie and coffee lover and we spent most of our 2 hour flight from Chicago chatting. 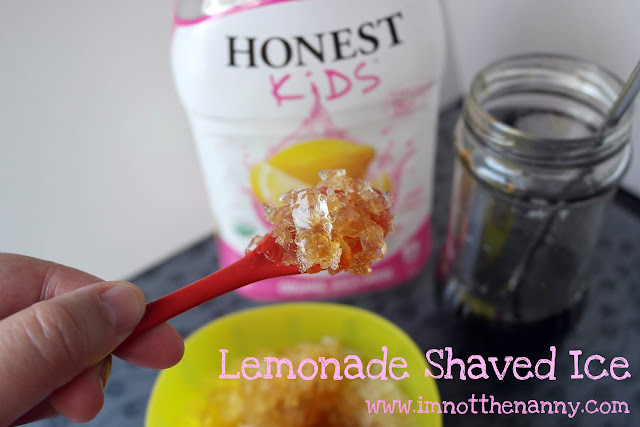 I told him that I wanted to make an Honest Kids snow cone syrups so the Honest Tea team dropped off some tea and Honest Kids products from us to sample. 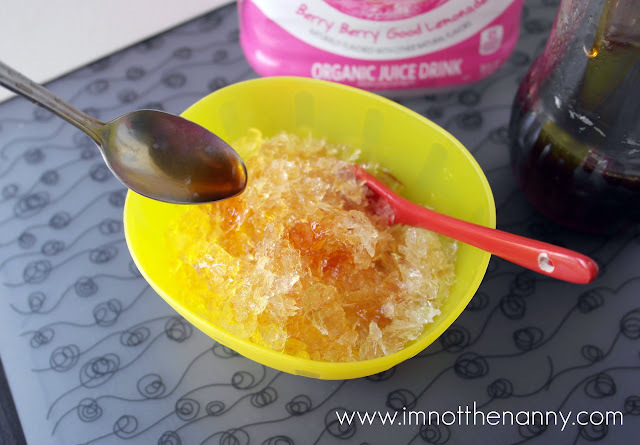 And of course a bottle of Honest Kids Berry Berry Good Lemonade for my snow cone experiment. Basically making a syrup involves a liquid (usually water), sugar, and something to flavor it. You mix and simmer it over the stove until it’s thick and sweet. I’ve made syrup with fresh and frozen fruit. I’ve seen recipes for mint infused syrups for mojitos. I was distracted by my kids so I let my syrup cook down more than I wanted. The syrup started to carmelize and would have burned if I hadn’t caught it sooner. Turns out that worked for my Berry Berry Good Lemonade syrup. The carmelization gives it a lot more depth. Happy accidents, right? Do you like shaved ice, or as we call it in Louisiana, snoballs? What’s your favorite flavor? Combine lemonade and sugar in a sauce pan. Bring to boil. Cook on medium to medium low until the syrup becomes thick. This can take anywhere from 30 minutes to an hour. Once it reaches desired consistency, add lemon juice to taste. Pour into a jar or a plastic container. Allow to cool completely. Serve on shaved ice and enjoy! It should keep in the fridge for a week, if it lasts that long. Honest Tea provided me with product to sample. All opinions are my own.